Global trade is shifting and the model that saw maritime superpowers located in the western world controlling cargo flows across the high seas is giving way to a more multi-directional and multimodal future. 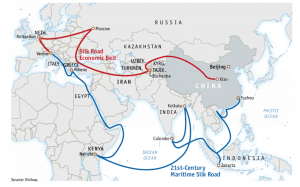 Heavily influencing the new dynamics of world trade will be China, not least through One Belt One Road (OBOR), the multi-trillion dollar initiative that aims to reshape intercontinental trade through a new network of maritime and landside links between Asia, Europe and Africa. At the recent Belt and Road Summit in Beijing, China’s President Xi Jinping announced that China will lend an extra USD124 bn to OBOR, including massive infrastructure development to support long-haul railfreight routes connecting China with Europe. Looking at Chinese investments in Australia, Africa, central and south America, some have said that OBOR could be easily extended to a global transport system. After President Trump’s withdrawal from the Trans-Pacific Partnership (TPP) and, possibly, from NAFTA in the near future, China is already stepping in to fill the gap, becoming the unquestionable global force of international trade. One Belt One Road (OBOR) integration plan.